ZQKMGDZ - 10.000 km² gegen die Zeit was founded at new years day 2012 as a two piece band by Don Alfredo (guitar & vocals) and Don Fernando (drums). From the beginning on, their goal was to create visions of time traveling between planets and to transfer this idea into a musical reality. 2013 Don Libido (bass) jumped aboard the intergalactic spaceship of ZQKMGDZ. In this constellation they produced a manifest under the name "Dimension Plasma" which was produced in the halls of "Rosenquarz Recording Studios" and will come out on vinyl via Pink Tank Records, autumn this year! This recording shows up that it is possible to create a new sound which we will call "Interstellar Psycho Doom“! Dark, heavy, massiv, fuzzy and psychedelic! 10,000 km² gegen die Zeit are ready for new time travel on the stages of this and other planets! ZQKMGDZ are a self proclaimed – Interstellar Psycho Doom – Band. What the hell does that. I don't have a freaking clue. What I can tell you is that their debut album – Dimension Plasma – is one freaky sideshow of crazed Psychedelic Doom and Stoner Metal sounds and riffs. It feels like an all out musical jam between Black Sabbath, Hawkwind and Ufomammut. They have been signed to our good pals – Pink Tank Records – and I may have to say that this could be the finest band Jan has signed to his label. ZQKMGDZ will take you on a cosmic and spacey trip of your own mind. 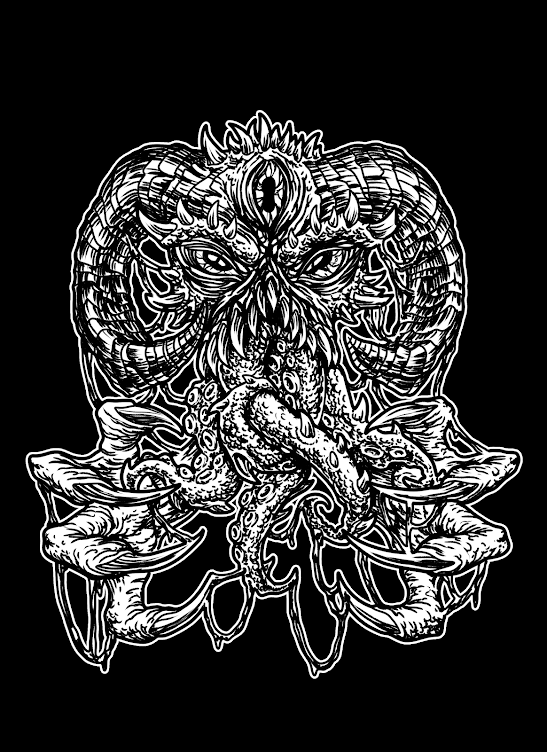 Opening track – Brainsnail Octopus – perfectly captures these insane musical astronauts as they venture from Sabbath type Doom with Hawkwind style Space Rock with added Ufomammut crazy psychedelic menace. Though with their own magnetic charm. It's one crazy as hell exercise in sound and volume as ZQKMGDZ lay on the fuzz through out the albums 32 minute run time. Second track Mammoth Manifest has lead vocalist – Don Alfredo – tripping out his mind like he is coming down from a bad LSD Trip with his bandmates feeding him the deadly musical drug to keep him in his drug induced state. The track has echoes of 60s/70s Psychedelic Hard Rock showing here and there. It feels like an extended jam session at times but that's the beauty of the album. It's a crazy trip where anything goes. Just enjoy the delicious music that ZQKMGDZ have created here. Third track – Ambrosia – is the more straight forward rock song that ZQKMGDZ have on offer here. Well what I mean it's more structured compared to the rest of the songs. It's still crazy in it's own right just in a different fuzzed up way. ZQKMGDZ capture the essence of what Psychedelic Doom/Stoner Metal should really be all about. Loud and violent fuzzy riffs brimming to fully explode at any second. The vocals have a weird experimental feel that only adds to the trippy atmosphere. Play this one at full volume to get the full effect. ZQKMGDZ leave the best track till last with the 15 minute epic – Astro Sabbath / Dimension Plasma. Two songs created as one surreal Doom/Stoner Metal experience. Quite possibly. Just sit back for this mammoth and insane song that will expand your mind for one final round. The fuzz is laid on nice and thick as ZQKMGDZ play at a slow pace before adding different sounds along the way. It's a great way to end the album as your slowly brought back to reality. My advice – Press play once more as this is an album you need to experience over and over again. Thanks to Jan at Pink Tank Records. Dimension Plasma will be available to buy on Vinyl from Pink Tank Records from January 2015.